Encounter a falling wizard and investigate his belongings. Follow the north path out of Seyda Neen. When you hear the scream, look up to see the falling wizard. Read his journal, and loot his corpse. Flying can be hazardous to your health. Tarhiel's exact location is (-16747, -58568). 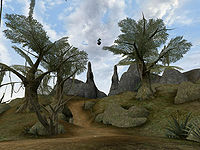 Follow the path northwest out of Seyda Neen to Hla Oad, and you will soon hear a strange scream coming out of nowhere. 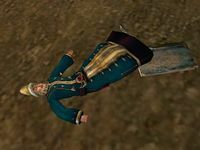 Suddenly, a Bosmer by the name of Tarhiel in wizard's garments plummets out of the sky to his death. If you approach him and read his journal, you will find that he had completed a spell he thought gave him the power of flight. Three of these scrolls can be found on his corpse. This quest does not result in any entries in your journal. Tarhiel carries an Iron Sparksword (Shock Damage 1-4 points on strike), which is a good weapon for starting players. You can reduce the damage done when you land by increasing your Acrobatics skill, landing in water, or, better yet, by using a Slowfall spell. Another way to survive is to use a second scroll just before you hit the ground. This takes a little bit of timing, since you have to land within the seven second window, but it can make for a pretty satisfying travel experience. Unfortunately, it does waste another scroll, and since these three scrolls are the only ones you can ever get, you'll only be able to do this once (or twice in a row, if you manage to jump again before the landing spell expires). You can also use a Levitation spell before you land—try to cast it just before you land so you don't have too far to go to reach the ground. Try obtaining slowfall or levitation from an item if you use this method, as the activation is instant and guaranteed. If you don't have any of the above, or miss trying to land in water, you can also save your game just before you hit the ground and reload. This allows you to fall and not have any damage done to you (unless you were too high already). On unpatched versions of the game, the scrolls can be reused if dropped immediately. You can save Tarhiel by casting a Slowfall spell on him, but should you succeed you won't get any information from him. He'll simply state "I don't want to talk about it" and stop talking to you. You won't get the scrolls if you do this, unless you pickpocket them or kill him yourself afterwards. Somewhat humorously, you can also speak with Tarhiel just before he hits the ground. As with some voices (such as Daedric Princes), Tarhiel's scream is not actually produced by Tarhiel, but rather by you. This is likely why the scream sounds so close by when Tarhiel is falling.